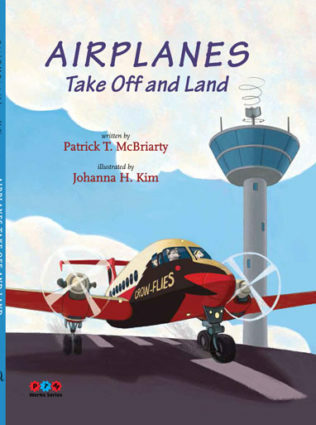 Airplanes Take off and Land by Patrick McBriarty is the second book in the PTM Werks Series and introduces Harry on his very first airplane ride. The reader gets to follow Harry behind-the-scenes to see the many steps of flying a commercial aircraft. Beautifully illustrated by Johanna H. Kim, it presents a fanciful world of animal characters, vehicles, and aircraft. Airplanes Take off and Land introduces Harry (a lamb) on his very first airplane flight to learn all about how airplanes take off and land with his Aunt Stacey, a pilot. There is a lot to prepare before each flight as Aunt Stacey takes Harry through the special crew entrance and stop in the Pilots Lounge to file a flight plan. They walk through the preflight inspection checking the airplane before entering the cockpit of Crow-Flies Air Flight 6 to meet Co-pilot Schimer (a wolf) on their flight from Crosstown Field to Bayside Landing. Fuel truck driver, Mikey (a polar bear) pulls up, connects and hose to fill the airplane’s fuel tank. Harry gets to sit in the jump seat of the cockpit for the entire flight to see everything that goes on before they take off, fly, and safely land Crow-Flies Air Flight 6. The story is full of animal characters, who all take part in the flight from Crosstown Field to Bayside Landing. What does Harry think about flying? Find out in this wonderful book sure to be a favorite, especially with young aviation fans and the pilots of tomorrow. Airplanes Take off and Land (April 2015) is published by CurlyQ Press, an imprint of Applewood Books, and distributed by Ingram (IPS) and Baker & Taylor. Ask for it at your local library and bookseller. The entire PTM Werks Series is available online at Amazon or Barnes & Noble.com. Beside finding this book at he Chicago, L.A. County, Seattle, Dallas, or New York Public Libraries (and many more! ), it sold at the Smithsonian Air & Space Museum gift shop in Washington D.C.!